The Ultimate Showdown - Snaps vs. Velcro: Is one better than the other? Cloth diapering can be very overwhelming, that we know for sure! And just one of the things that can cause your head to spin is whether or not to choose a snap closure system or a velcro system. What makes one better than the other and is one clearly better than the other? 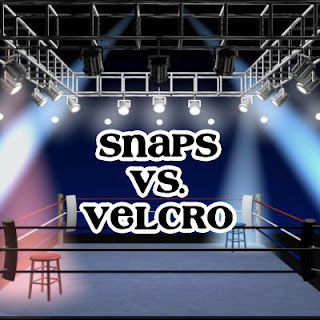 In this Blog post Snaps and Velcro will go head to head and we'll let you decide which you think is the better option. What in the world is Aplix and where does it fit in this conversation? Aplix, Touchtape and Velcro are pretty much all in the same family. Aplix and Velcro have a stronger hold than Touchtape but all three are "hook and loop" type closures. In this discussion we'll just use the term "velcro." Let's list the pro's and con's of both Snaps and Velcro. In the RED corner we'll have Velcro and in the BLUE we'll have Snaps! Provides a very adjustable and customizable fit. Very easy to use. Good for babysitters and daddy's, anyone whom you don't want to overwhelm or that you think might get confused by snaps. Can be noisy which interests babies and easily becomes something they want to mess with. Leads to an interest in taking their diapers off. Depending on how often you wash, velcro does wear out over time and may need to be replaced. Can collect a lot of lint which can affect it's strength. If not secured properly in the wash and dry cycle velcro can attach to other diapers and cause damage as well as become a lint magnet. When it comes into contact with the babies skin it can cause irritations and scratches making baby uncomfortable. Babies can undo velcro closures more easily than snaps. Much more durable than Velcro and can last the life of a diaper. Much more quiet than Velcro. No risk of damaging other diapers in the laundry. Not abrasive and will not scratch the babies skin like velcro. Babies are less likely to take off their own diapers. Limited number of snaps/settings make them a bit less adjustable than Velcro. Not as easy to use as velcro. Could be a learning curve for newbies and caregivers. Harder to replace a broken snap than to replace worn out velcro, although most manufacturers provide snap warranties on their diapers. The Judges Scorecard: According to our scorecard we'd recommend you choose snap closures whenever possible. You might even have noticed that companies who used to exclusively produce velcro closure systems are now also offering their diapers in a snap closure. This further proves that snaps are the bees knees! Whoop Whoop! I'm ogling your diapers, by the way and following the blog. How do the snaps compare with leaks around the waist for a tummy sleeper? The few times we've had one on, they've leaked, BUT I found out the diaper had a hole in the lamination on the pul that needed replaced, but I've been reticent to try again. I'd love some thoughts on that. I'm torn on the issue...I prefer velcro if I'm going out and will have to change my baby in a restroom because he squirms so much it is difficult to fasten the snaps! However, for wear and tear the snap diapers still look like new. I thought your points were great though, except that the snap noise startles my little one, but he doesn't seem to even notice the velcro noise. Oh, and I wish I'd have found Knickernappies sooner! Since Knickernappies are side-snapping diapers, they are very leak proof for most babies who are tummy sleepers. Front-closing diapers have more of a tendency to leak simply because there are holes in the PUL from the sewing or the snaps...that makes a place that moisture could possibly escape. One great benefit of side-snap diapers! We started CD-ing with BumGenius OS diaps. And found we HATED the velcro. We 100% definitely prefer snaps. Every time. Like Jennie, I sometimes prefer velcro. I think it's ok to have a variety and use different diapers in different situations. We love the Knickernappies and use those almost exclusively, but when we used fitted for a while, we found only one cover (with velcro) that could fit our daughter without giving her horrible red lines around her thighs. The covers got a lot of wear but are still working pretty well and we were able to set them aside for the next baby to use.